Method Gets the G'huun World First! - Kill video from the stream, wipecount and more. Uldir Race Day 8: 4.1% G'huun Lives to the Second Week - Method get the boss down to 4.1%, Limit may have extended their lockout and we get World First and second Mythrax kill videos. Uldir Race Day 7: G'huun Down to 12% and Nerfed - A 12% try from Method and a nerf to the big worm. Uldir Race Day 6: Method Catch Up, Mythrax Video - Method and Exorsus catch up and we get a Mythrax kill video. 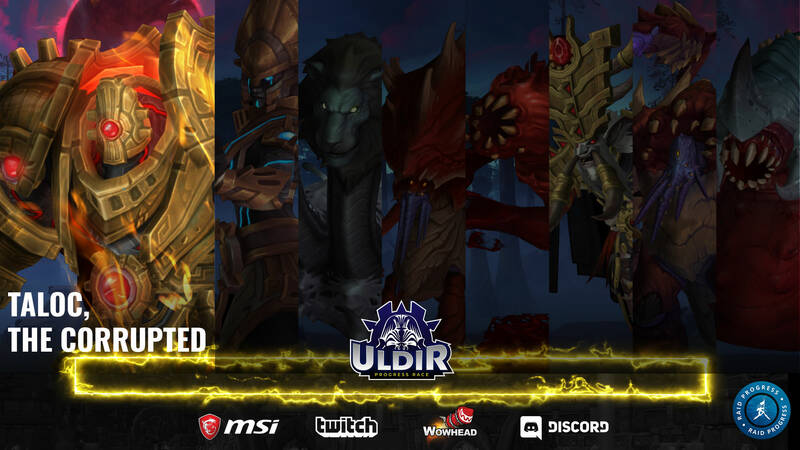 Uldir Race Day 5: Limit World First 7/8 - Limit head to the top and take a strong lead with their Mythrax the Unraveler World FIrst. Uldir Race Day 4: Zul Down, 6/8 by EU and US - Method get the World First on Zul, Reborn and Limit catch up to them quickly. Uldir WF Race Day 3: US 5/8, Devourer Down - Limit grab the World First after some more hotfix nerfs to Fetid Devourer. Uldir Mythic WF Race Day 2: Fetid Devourer Endboss - EU guilds catch up but no one can get past the 5th boss, Fetid Devourer and 8 guilds are stuck at 4/8. Uldir Mythic WF Race Day 1: 4 Bosses Down - Big Dumb Guild and Limit get 4 bosses down before EU servers come up, Blizzard nerfs Fetid Devourer and we get to see three WF kill videos. The gates of Mythic Uldir have opened and the US and OC servers are coming up after maintenance. Now it remains to be seen who will go in early and grab those World Firsts before the EU an Asian guilds have had a chance to enter the first raid of Battle for Azeroth. As always, we'll have summary posts for each day early in the EU morning. Of the possible contenders on the US/OC scene we have Wildcard Gaming, formerly Easy, who have already taken a WF in Heroic, with their G'huun kill, and seem eager to get their new name heard, so they might just be the leading US guild. On the other hand, Limit has been a dominant presence in the US/OC scene for a long time now, grabbing most WFs and being the only real competition to the EU and Asian guilds in the endgame. We also have SNF and Big Dumb Guild who have gotten some World Firsts in the past, and have been known to raid early, so the competition for those first few kills should be high. Blood Legion also seem to have returned after a long hiatus, as they will be raiding "semi-competitively" in BfA, but it remains to be seen what exactly that means. As always, we'll be using Method's raid progress coverage for our own summaries and you can head on over to their site to follow the race live, both today with the usual updates and tomorrow with the guild itself streaming the race live. For other streams of the progress race, head on over to twitch's WoW page and you'll be sure to find tons of players showing off their journey through Uldir. We'll also be using this article as a hub for all the race summary posts. The race is about to begin and you can check out all of our coverage right here. Looking forward to it! Good luck, everyone!